UK General Election – Really No Hope for Electoral Reform? A recent post on Fruits and Votes, discusses the effect of the UK General Elections 2017 on the likelihood of electoral reform. The author claims that none of the major parties has incentives to advocate for electoral system change in the light of the last election outcomes. According to the argumentation put forward, a higher number of very marginal seats decreases parties’ benefits of electoral reform because voters regard their votes as decisive. 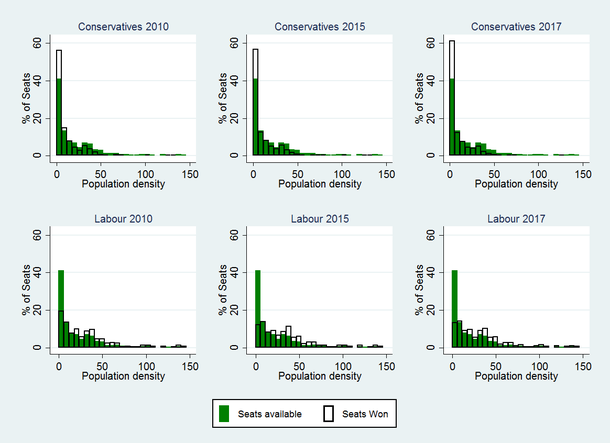 In this blog post, I argue that the Conservative party, despite its current anti-PR stance, might have a strategic interest in electoral reform, because they do not fully exploit their voter potential, in particular in cities, where many seats are available. In the 2017 General election, on average the margin of victory of the Conservatives amounted to 23 percent, this is a slight decrease compared to 2015 (25 percent) but a greater increase in comparison to 2010 (19 percent). 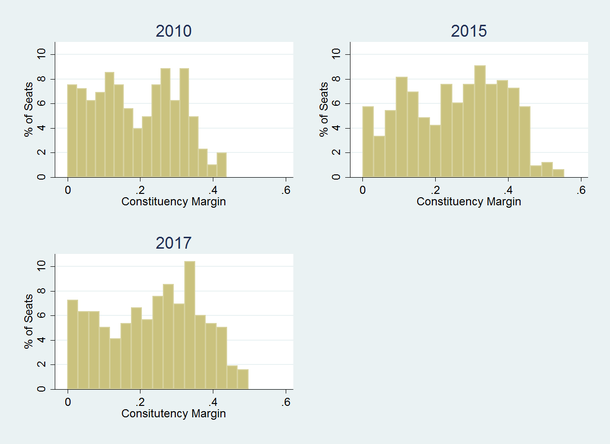 As Figure1 shows, the share of very marginal seats (lead of less than 5 percent) won by the Conservative has increased from 7.8 percent in 2015 to 12.6 percent in 2017 but remains slightly below the 13.1 percent of marginal seats in 2010 . Instead, 55 percent of the seats, the Conservative lost remained rather uncontested. In those cases, the Tories lost to the winning party by more than the average margin of 23 percent. Although this share decreased from 2015 (60 percent), it is considerably higher than in 2010 (43 percent). This trend is also observable in Figure 2. In the unsuccessful districts of 2017, the Tories gained a lower number of votes compared to the Labour party in its lost races. In turn, according to the rational that a high number of marginal seats strengthen the status quo, as more voters regard their vote decisive, the Conservatives have no interest in maintaining this status quo. Apparently, they are not able to mobilize their voters in many electoral districts, in which their supporters do believe a vote for the Conservatives to be insignificant. In a more proportional system, the Tories should be able to mobilize more voters, as less votes are wasted, which should motivate voters to cast a ballot for their preferred party even though it might not win most votes in the district. 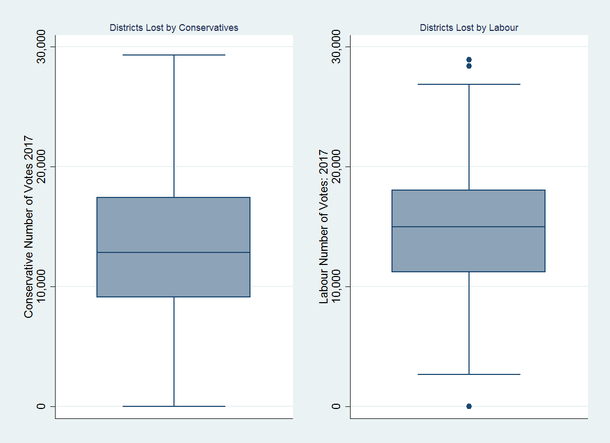 Figure 3 displays boxplots of the population density per districts separately by all districts and those won by the Tories in the General Election of 2017. It becomes obvious that the Conservatives have their strongholds in low population density districts and win a higher-than-average number of seats in very rural areas. The Labour majorities are compared to this far more equally distributed across electoral districts with varying population density and their share of seats in rural areas have been decreasing as shown by Figure 4. In fact, this concentration of voters to rural areas could actually result in a vote-seat distortion favorable to the Labour party, which could receive more seats than the Tories with fewer popular votes. 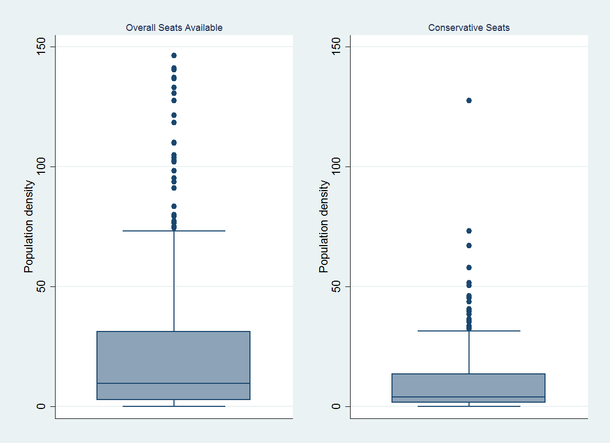 And it leads us back to the first argument: In a more proportional system, the Conservatives might be better able to mobilize their voters in more urban districts where they do not seem to have a chance of winning at this point in time. Thus far, the Conservatives are vehemently opposed to electoral reform towards a more proportional system and even propose single-seat plurality for mayoral elections, however from a vote-seeking point of view, the party could actually benefit from the introduction of a more permissive electoral system. Electoral reform wouldn’t be so bad after all. Lead of less than 10 percent won by the Conservative has increased between 2015 (17 percent) and 2017 (21 percent) but is still below the number of very marginal seats in 2010 (26 percent).